Counter Strike: Global Offensive has soared to new heights these past few months, luring in tons of new players daily and keeping current players entertained. One of the biggest factors that keeps everyone entertained is the gambling factor that can be associated with the in game weapon finishes, or skins. Everything seems like fun and games right? I mean, these are just digital items that have no real value, but that's where you're wrong. Skins in CS:GO can easily be pawned off for PayPal cash or other forms of currency, which is alright if you play within your limits. Time and time again I have seen Twitch Streamers or YouTubers lose thousands of dollars in skins and surprisingly enough, they think nothing of it. This is because they are grown adults with reliable income, but that cannot be said about younger children who play CS:GO. A little while back, I was on a random CS:GO server just minding my own business. I had the pleasure of listening in on a young teenager, no more than 13 or 14 years old, talking about how he had already lost around $200 worth of skins in the past month. That got me thinking, regular gambling attractions require the patron to be of a certain age to gamble, but how would one enforce this in a game such as Counter Strike? If I wanted to, I could list off a dozen websites that allow users to deposit CS:GO skins, convert those skins into a currency value on that site and then use said currency to play various gambling games such as blackjack, or even something as simple as a coin flip, all in hopes of winning the jackpot. See, gambling on one of the many third party CS:GO gambling sites is no different from regular gambling. Players will still become addicted, and there isn't any good way to iron out whether it's a competent adult playing or if it's a child. Children mimicking their favourite Twitch Streamers could be one of the roots of the problem, as there is surprisingly a large market for CS:GO gambling on Twitch. A small survey was conducted on Reddit where users who had gambled underage were asked to share just how much they had lost. Obviously the results aren't concrete, but this is definitely a good guide to show us just what the underage gambling community in CS:GO is like. 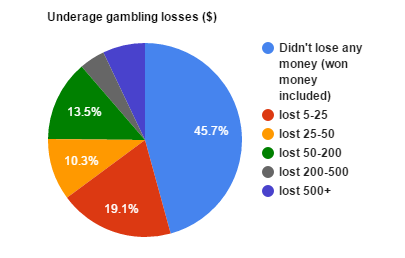 Having children around a gambling scene that is so easily accessible is a very bad idea as the results have shown. A child only needs a skin worth a few bucks to get started, and we all know that once you've started and have become addicted, it's very hard to quit. What should Valve, or any of the other third party companies do to combat the rise of underage gambling in CS:GO? It's far too accessible and the end results are devastating. What do you think? What guidelines should be in place to prevent children from blowing hundreds in online gambling? Leave your thoughts below! Robert Downey Jr, Green_Man, kobraEnterprise and 3 others like this.